Lovely and updated 2 bedroom, 1 bath cottage with outdoor shower and sun room. 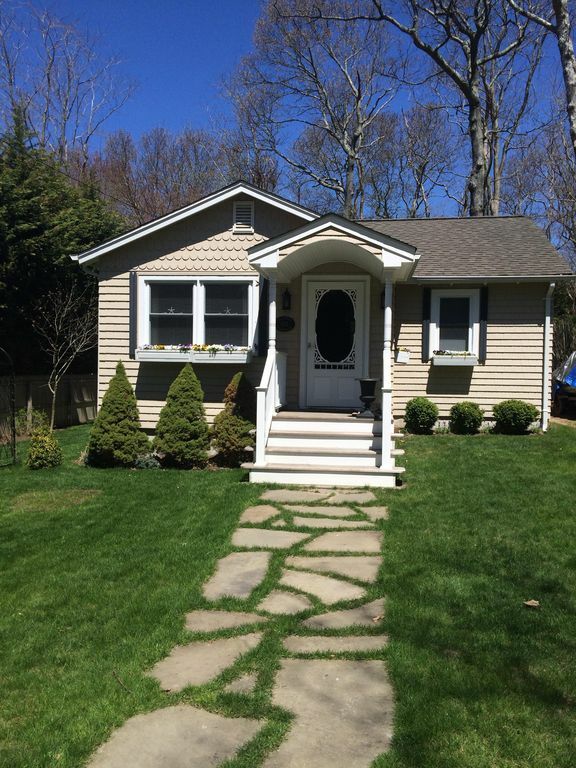 Close to vineyards, restaurants, shopping and within walking distance to a beautiful LI Sound beach. Just a short drive to the nautical village of Greenport where you can stroll the seaport town with its trendy restaurants, art galleries and charming shops. House comes with a fully equipped kitchen, large screen tv's, wifi, cable, beach chairs, 2 bicycles and outdoor deck all in a tranquil setting. Charming and close to beach! great place, quiet block, responsive owner. great hospitality. smallish bed, but very comfy! 2 short blocks from beach. highly recommended! This place was perfect for my family of 4. Everything was in great condition and the kitchen was a pleasure to use. The manner in which the doors to the bathroom and bedrooms was a touch awkward. The second bedroom with the twin bed and trundle worked will for my children. The sun room in the back was perfect for those who woke early and didn't want to disturb anyone still sleeping. The backyard was cozy and we were happy to use the bikes that were made available with the house. Kevin was very accommodating. We will definitely look for the opportunity to come back. We had a wonderful stay at this cottage. Very cute beachy decor and comfortable furnishings. The two bedrooms were perfect for our needs with two adults and two small kids. With a sunroom in the back, a nice sized living area and an outdoor patio, we had plenty of room to spread out. The kitchen also had everything we needed, which I always appreciate so much in rental properties. The outdoor shower was also great after a day at the beach. The closest beach is a rocky beach on the Long Island Sound and a short walk away. Sandy beaches are a short drive away as is the town of Southold and Greenport. The street is really quiet. So in short, a perfect location for us. Kevin was very responsive to all of my questions. We could not have had a better stay. Adorable cottage, location could not be better. We really enjoyed our stay here. The location can’t be beat. Very close to the beach (actually walking distance that’s manageable for a very pregnant person and a toddler) and close to some of our favorite vineyards in the North Fork. House is adorable and clean (and I’m pretty picky), and just the right size with a lovely, fully enclosed sunroom off the back that we enjoyed very much. Kitchen is well appointed and adorable. Laundry in the basement. There is also a nice outdoor shower for after the beach (and a nice deck/landscaping). This was our first time staying in Southold and enjoying the beaches, and we loved it and would certainly come back. The neighborhood seemed lovely, and there is a restaurant that had solid reviews down the street (we never made it there ourselves). Future renters/visitors should bring water shoes because the beaches are pebbly (as opposed to sandy) which I hadn’t realized. Thanks for having us! Perfect spot for a beach getaway. My husband and I wanted a relaxing week by the water and we couldn't have found a better spot. The cottage is everything you could want for a beach getaway. Beautifully decorated and so welcoming and comfortable! We loved everything about it. Spacious living room and sunroom, great little kitchen with everything you need, outdoor shower (great for de-sanding after a day at the beach), comfortable bed and the bikes were a nice little bonus! We went riding around the neighborhood several times...very enjoyable. Short walk to the beach, right in the middle of wine country, lots of farmers markets to visit and a quick drive to Greenport. Kevin is a terrific host and great to work with. Looking forward to planning another stay in the future.